Home / Blog / What is a Thermocouple? Posted On: 23rd July 2018 . 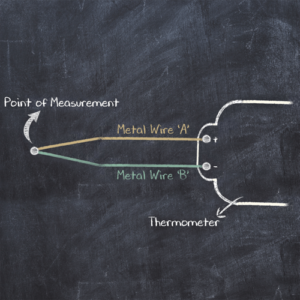 The Thermocouple itself is made by welding two dissimilar metal wires together, which form the point of measurement. The wires are then insulated from each other along their lengths and terminated with a connector for connection to a meter, or in our case a Hand-Held Thermometer. As the two metals in the Thermocouple are heated or cooled, they produce a very small, but measurable Voltage. The Thermometer measures this voltage, performs a calculation to correct for ambient temperature and then uses a look-up table to determine the actual temperature at the ‘Point of Measurement’, which it then displays digitally for us to read. The fundamental difference between Thermocouple types lies in the combinations of metals used to manufacture them, as each will have its own unique plot of Voltage versus Temperature. Thermocouples can measure temperature from absolute zero, that’s -273.15°C, all the way up to +1800°C. Comark principally manufactures probes using two types of wire, known as ‘Type K‘ and ‘Type T‘. Type K is the most popular thermocouple type in the world, due to its wide temperature range (-200°C to +1350°C) and low cost. It has a good accuracy of typically ±1.5°C over the range -40°C to +375°C. 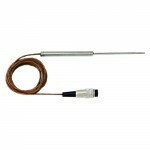 Note: Comark offers a wide range of Type K Thermocouple instruments and probes for general purpose operation. Type K Probes are generally supplied with green or red leads. Comark’s Type K probes are manufactured with the industry standard 2-pin or sub-miniature connector. Type T is also very popular due to its low cost and improved accuracy over Type K. However, it has a reduced temperature range of -200°C to +400°C. For most applications in handheld measurement, the advantage of using Type T is higher accuracy. Type T is accurate typically to ±0.5°C, making it ideal for applications where higher accuracy is required. Note: Type T probes come with brown or blue leads. The majority of Comark’s Type T Probes are manufactured with a Lumberg connector for added durability. Thermocouples are very fast to react to changes in temperature, so when speed and accuracy are required, they are ideal. They can be fashioned into many different designs of probe and can be protected in many ways to make the sensor more durable. The most common way to protect the thermocouple sensor is to place it into a metal sheath or shaft. 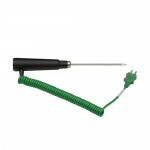 This form of penetration probe provides the durability to protect the sensor but does impact speed of response. Thermocouples can also be placed into flexible materials to create probes that bend. These are known as ‘minerally insulated thermocouples’. They can also be made into surface probes and air probes depending on the application. Thermocouple probes are the most versatile when it comes to new applications. 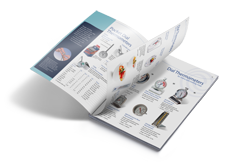 Which Thermocouple type should I choose? That depends on several factors; If accuracy is important then choose a Type T thermocouple; but if a wider temperature range is important then Type K might be better, especially if the application is for temperatures above 400°C. Type K is faster to respond in open air but when using a metal penetration probe difference is not noticeable. Visit our Full Probe Range for individual specifications or contact our Technical Team directly if you have any specific queries.